Kylie Jenner’s team are always on point with the 90’s trend, from brown lips to bleach washed overalls. This time she has brought back the hair tattoo and good god do I love it! The only problem I have with this trend is that it is the wrong season. This would work more at festivals and in the summer in general. Also it looks great on Kylie’s straight dark hair but curly blondes I’m afraid this one is not for you. 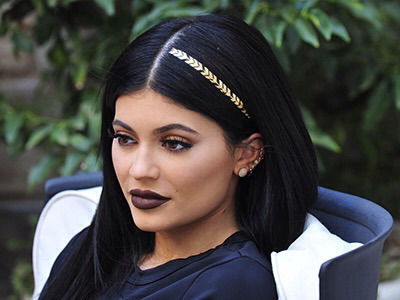 The hair tattoo that Kylie is sporting is by The Scunci and it can be used on both the hair and skin. It works in exactly the same way as the metallic tattoos designed for skin so I’m guessing you could use any branded transfers. What do you think of this trend? Could you see yourself wearing these in your hair? Let me know in the comments.